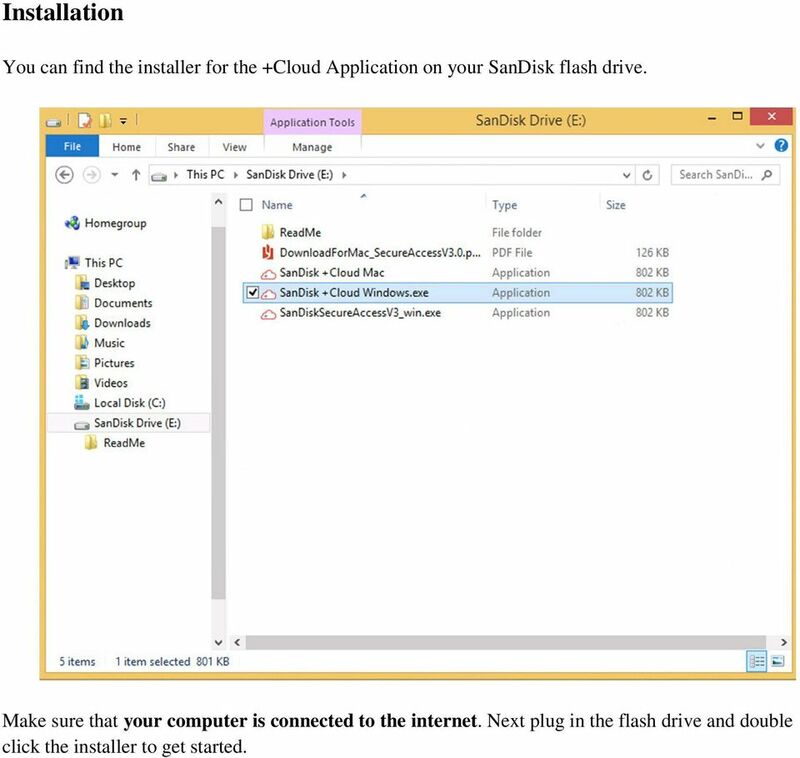 Download "You can find the installer for the +Cloud Application on your SanDisk flash drive." 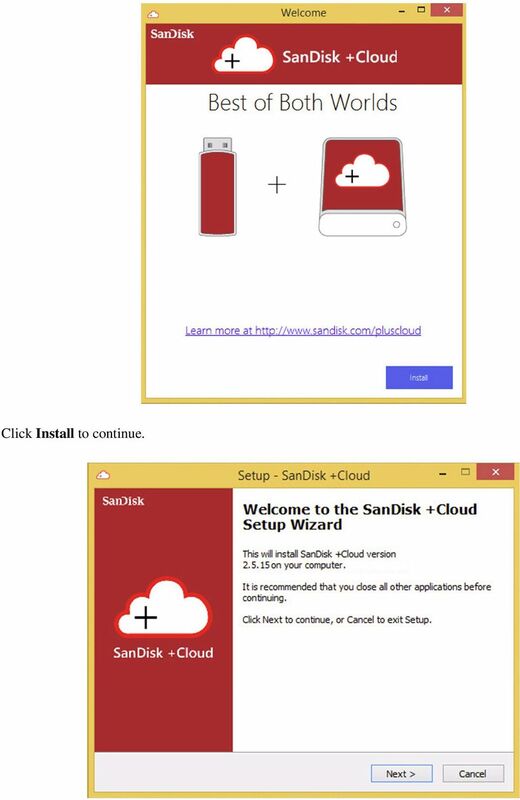 1 Installation You can find the installer for the +Cloud Application on your SanDisk flash drive. Make sure that your computer is connected to the internet. Next plug in the flash drive and double click the installer to get started. 2 Click Install to continue. 3 Once the required files are downloaded, the Setup window will appear. Click Next to continue the installation, or click Cancel to cancel the installation process. 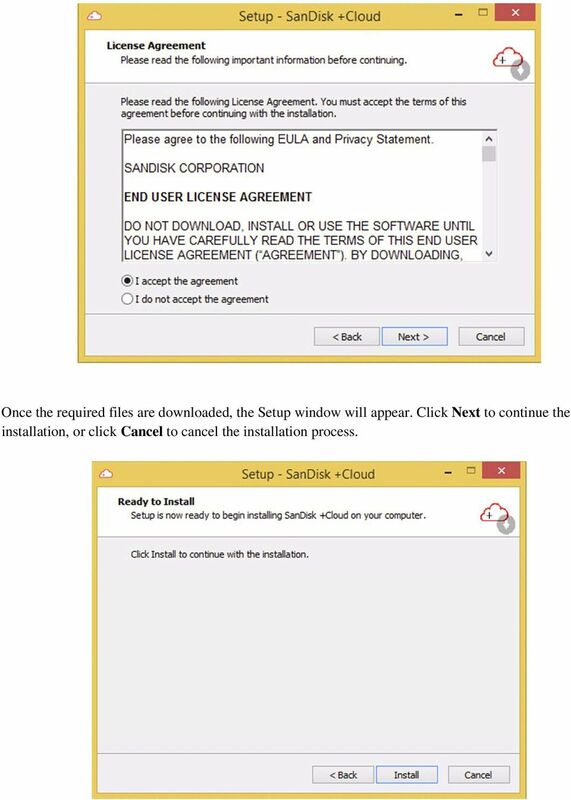 4 Once the installer is ready you will be prompted to confirm that you want to install the +Cloud Application. Click Install to finish the installation, click Back to go back to the previous screen, or click Cancel to cancel the installation process. Signing up for a New Account When the installation is complete a window will appear that will allow you to sign up for a new +Cloud Drive account. If you already have registered this SanDisk USB Flash Drive to an account click Have an account? Log in! at the bottom of the window to go directly to the login screen. 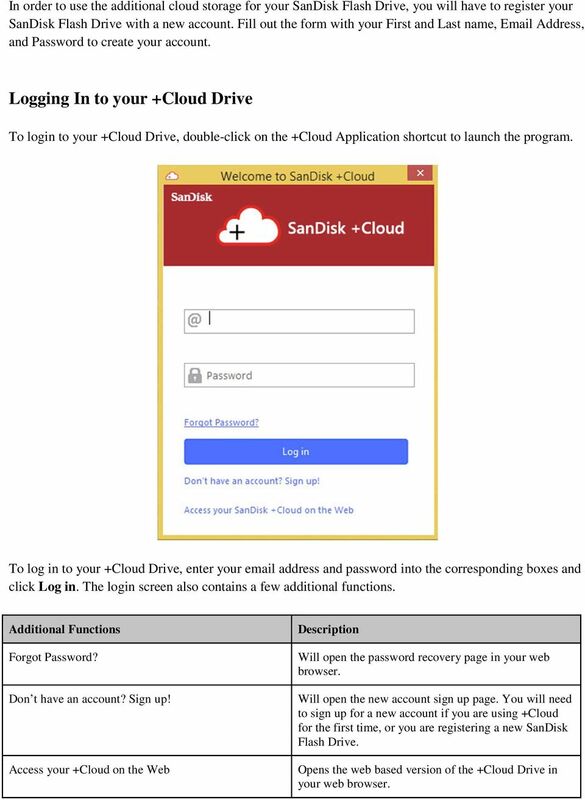 5 In order to use the additional cloud storage for your SanDisk Flash Drive, you will have to register your SanDisk Flash Drive with a new account. Fill out the form with your First and Last name, Address, and Password to create your account. 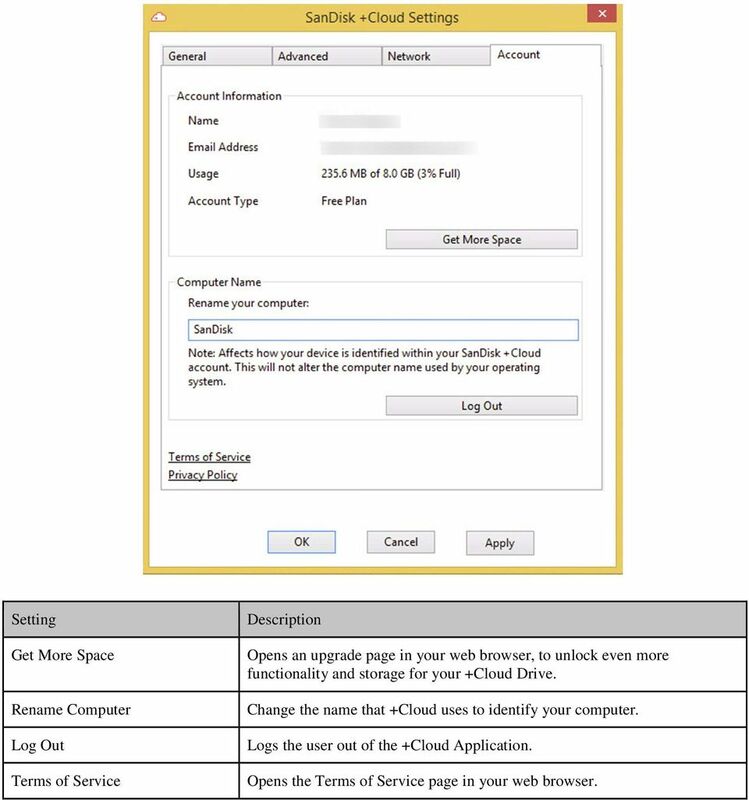 Logging In to your +Cloud Drive To login to your +Cloud Drive, double-click on the +Cloud Application shortcut to launch the program. To log in to your +Cloud Drive, enter your address and password into the corresponding boxes and click Log in. The login screen also contains a few additional functions. Additional Functions Forgot Password? Don t have an account? Sign up! Access your +Cloud on the Web Description Will open the password recovery page in your web browser. Will open the new account sign up page. 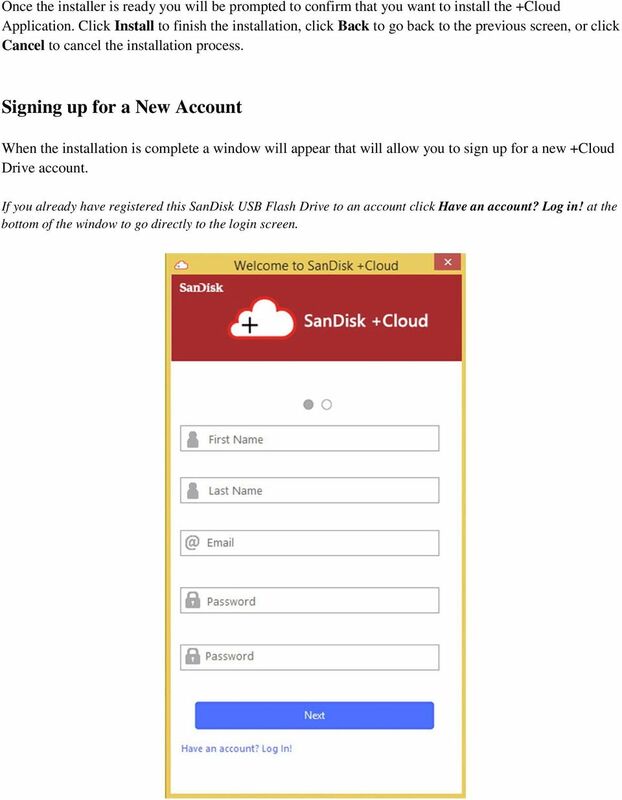 You will need to sign up for a new account if you are using +Cloud for the first time, or you are registering a new SanDisk Flash Drive. 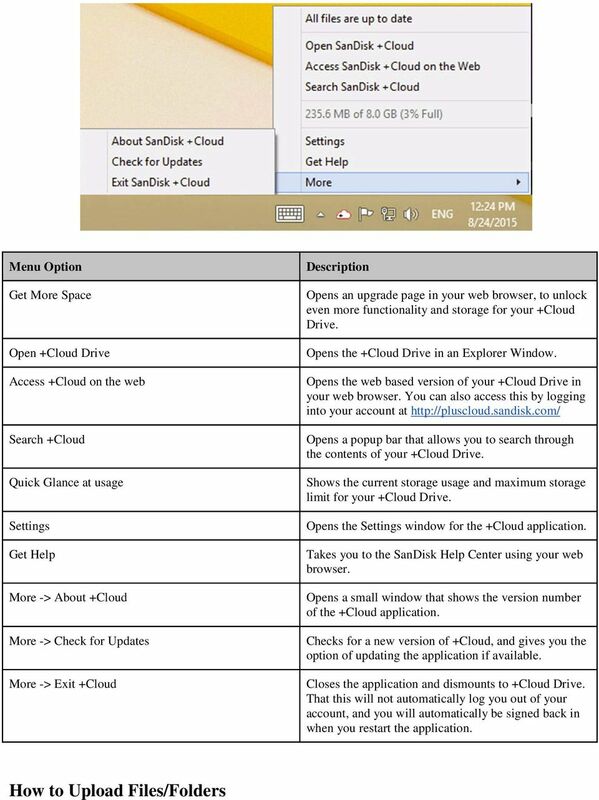 Opens the web based version of the +Cloud Drive in your web browser. 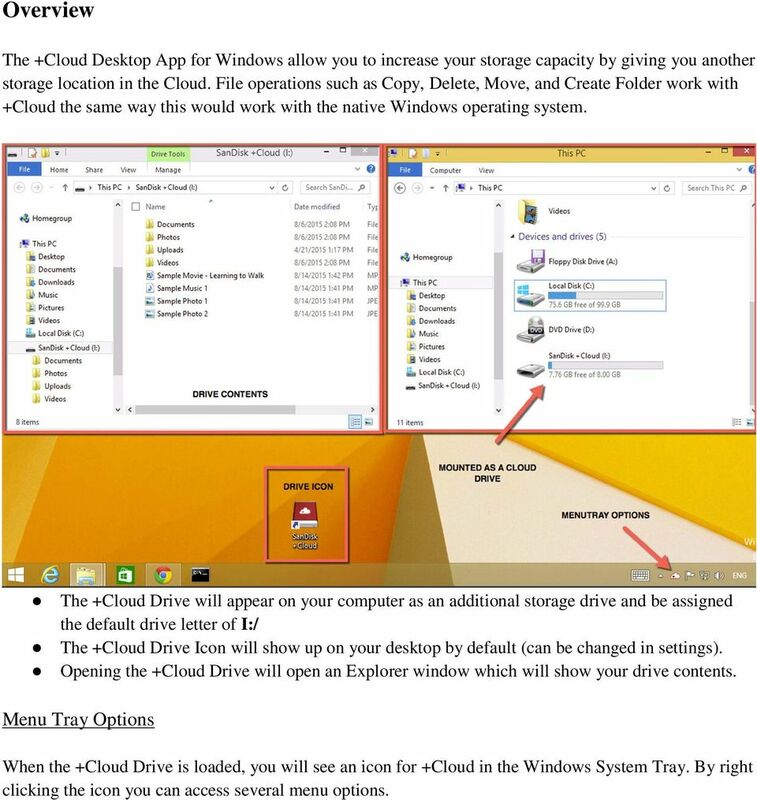 6 Overview The +Cloud Desktop App for Windows allow you to increase your storage capacity by giving you another storage location in the Cloud. File operations such as Copy, Delete, Move, and Create Folder work with +Cloud the same way this would work with the native Windows operating system. 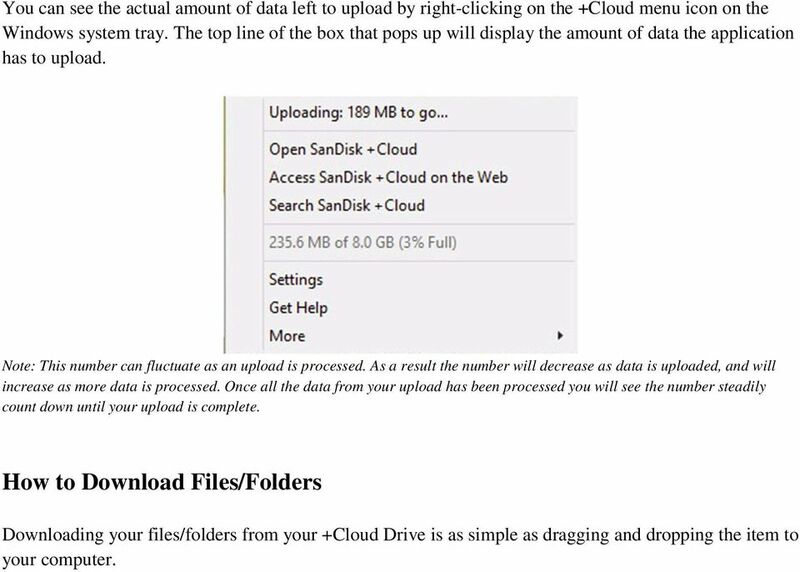 The +Cloud Drive will appear on your computer as an additional storage drive and be assigned the default drive letter of I:/ The +Cloud Drive Icon will show up on your desktop by default (can be changed in settings). Opening the +Cloud Drive will open an Explorer window which will show your drive contents. Menu Tray Options When the +Cloud Drive is loaded, you will see an icon for +Cloud in the Windows System Tray. By right clicking the icon you can access several menu options. 8 The +Cloud Application interfaces seamlessly with your operating system, making it work just like an external hard drive. 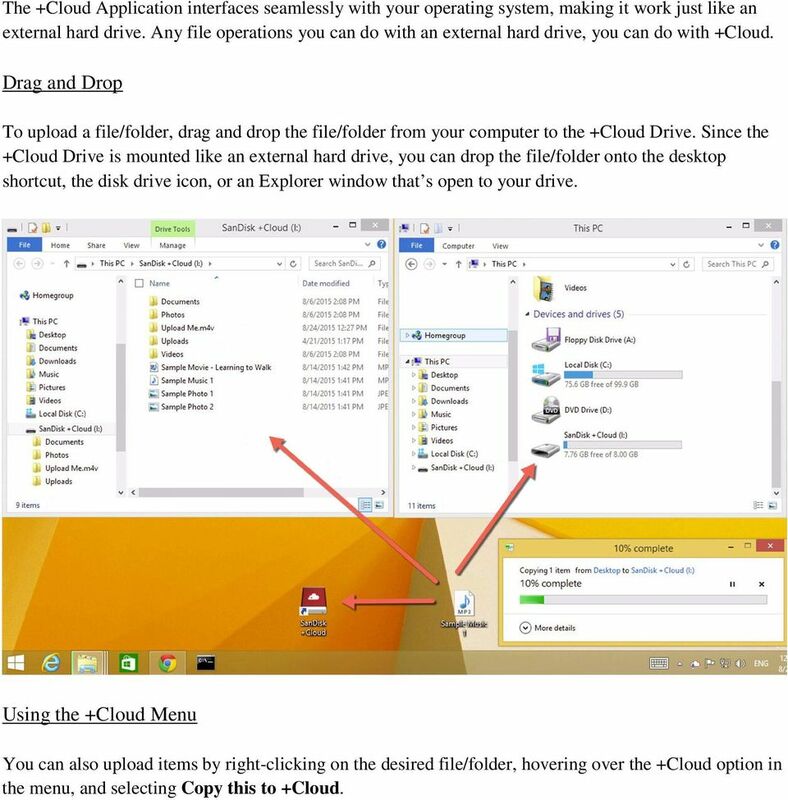 Any file operations you can do with an external hard drive, you can do with +Cloud. 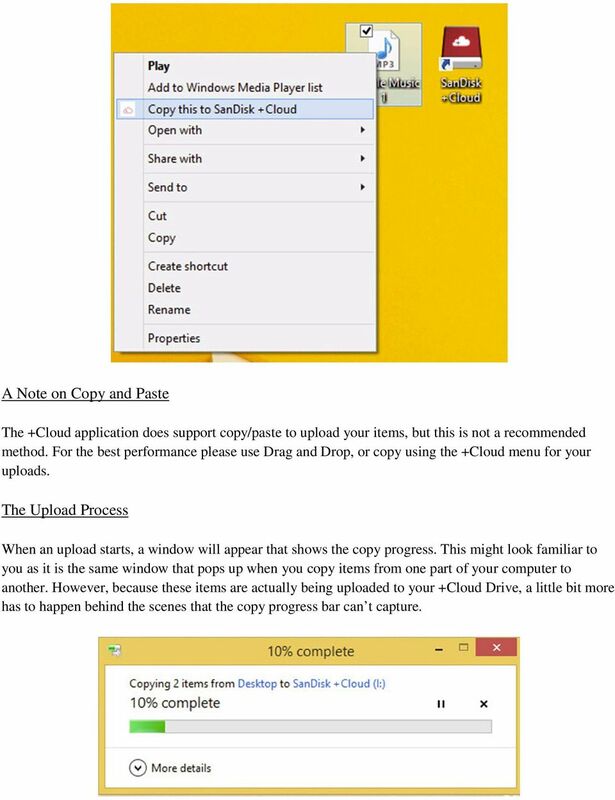 Drag and Drop To upload a file/folder, drag and drop the file/folder from your computer to the +Cloud Drive. Since the +Cloud Drive is mounted like an external hard drive, you can drop the file/folder onto the desktop shortcut, the disk drive icon, or an Explorer window that s open to your drive. 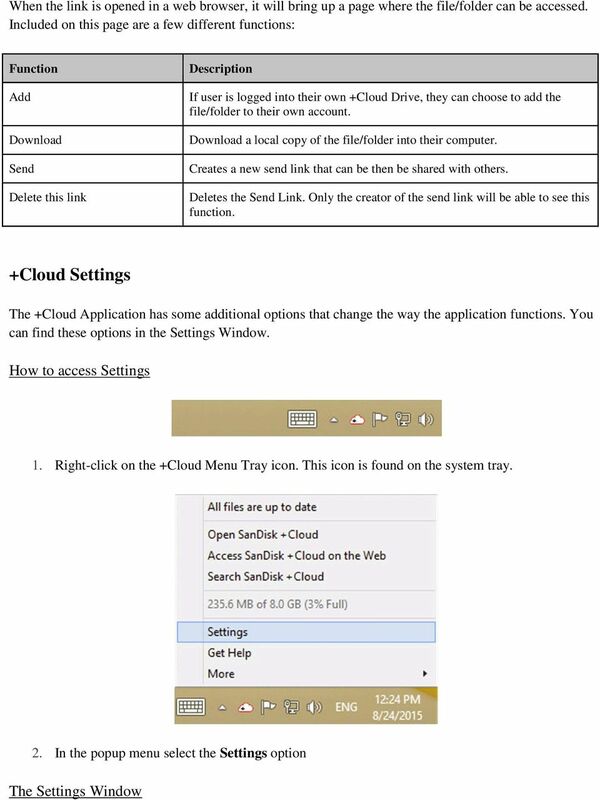 Using the +Cloud Menu You can also upload items by right-clicking on the desired file/folder, hovering over the +Cloud option in the menu, and selecting Copy this to +Cloud. 9 A Note on Copy and Paste The +Cloud application does support copy/paste to upload your items, but this is not a recommended method. For the best performance please use Drag and Drop, or copy using the +Cloud menu for your uploads. The Upload Process When an upload starts, a window will appear that shows the copy progress. This might look familiar to you as it is the same window that pops up when you copy items from one part of your computer to another. However, because these items are actually being uploaded to your +Cloud Drive, a little bit more has to happen behind the scenes that the copy progress bar can t capture. 10 You can see the actual amount of data left to upload by right-clicking on the +Cloud menu icon on the Windows system tray. The top line of the box that pops up will display the amount of data the application has to upload. Note: This number can fluctuate as an upload is processed. As a result the number will decrease as data is uploaded, and will increase as more data is processed. Once all the data from your upload has been processed you will see the number steadily count down until your upload is complete. 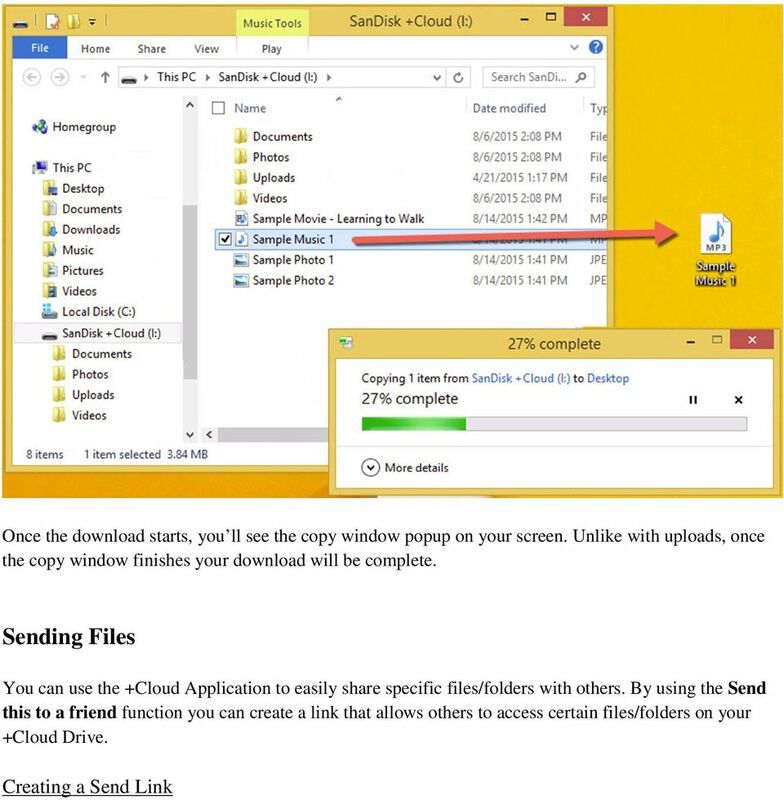 How to Download Files/Folders Downloading your files/folders from your +Cloud Drive is as simple as dragging and dropping the item to your computer. 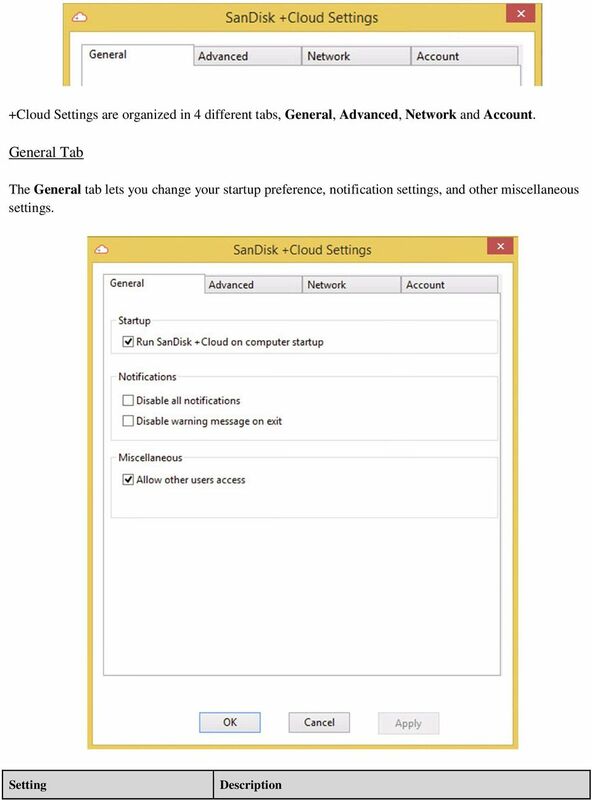 15 Run +Cloud Cloud on computer startup Disable all notifications Disable warning message on exit Allow other users access Enables +Cloud to start automatically when you start Windows. Disables +Cloud Cloud desktop notifications. Disables the warning dialog box when you close the Desktop Application. 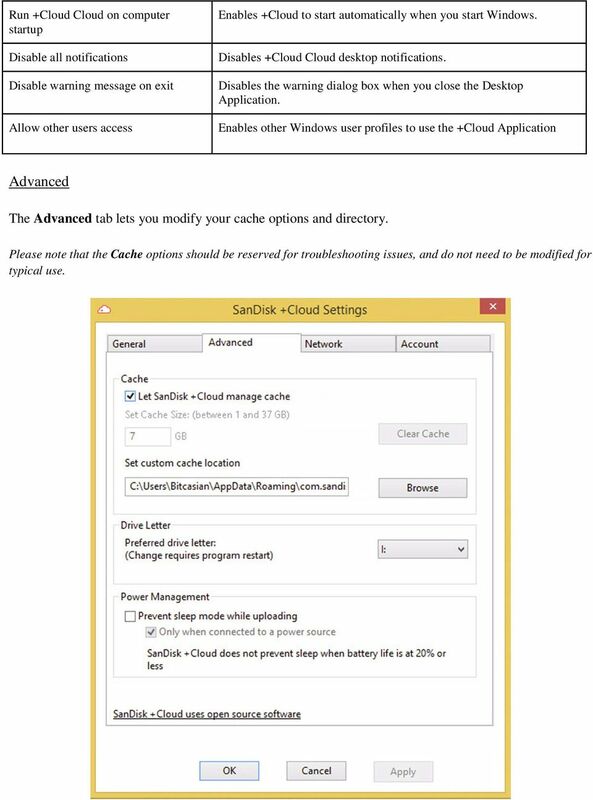 Enables other Windows user profiles to use the +Cloud Application Advanced The Advanced tab lets you modify your cache options and directory. Please note that the Cache options should be reserved for troubleshooting issues, and do not need to be modified for typical use. 16 Setting Let +Cloud manage cache Clear cache Set Cache Size Set customer cache location Preferred drive letter Prevent sleep mode while uploading Description Toggles automatic management of the cache. Enabled by default Clears all content in the cache. This will abort all data transfers in progress. Allows you to allocate a set amount of disk space for the cache. (Requires Let +Cloud manage cache to be disabled) Allows you to set a custom location for the cache. 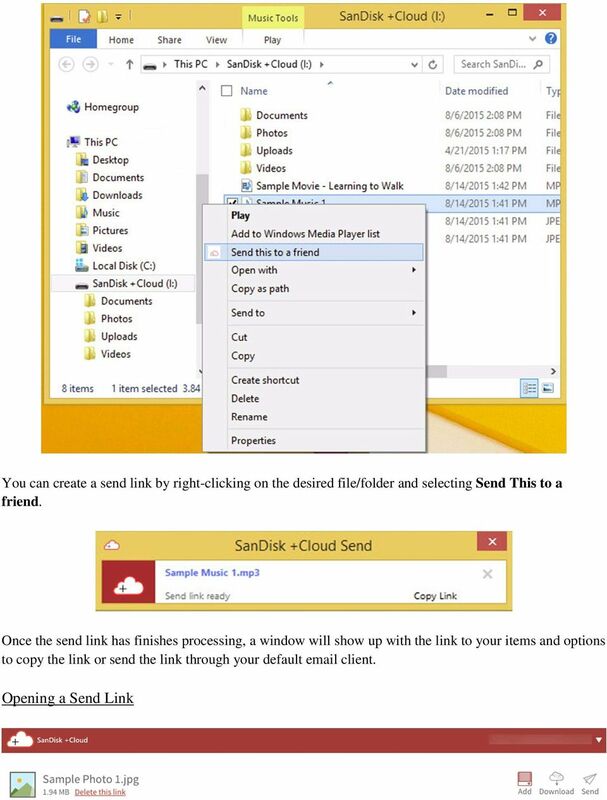 Allows you to set a custom drive letter for the +Cloud Drive. The default value is I:/ Enabling this prevents the computer from entering sleep mode when uploading. Enabling the sub option of Only when connected to a power source, only prevents sleep if your computer is plugged in. Network The Network tab, lets you limit the amount of upload bandwidth that +Cloud is allocated to use. 17 Setting Limit Upload Bandwidth Fillable Bandwidth Box Description Toggles the ability to restrict bandwidth usage for uploads using the +Cloud Application. 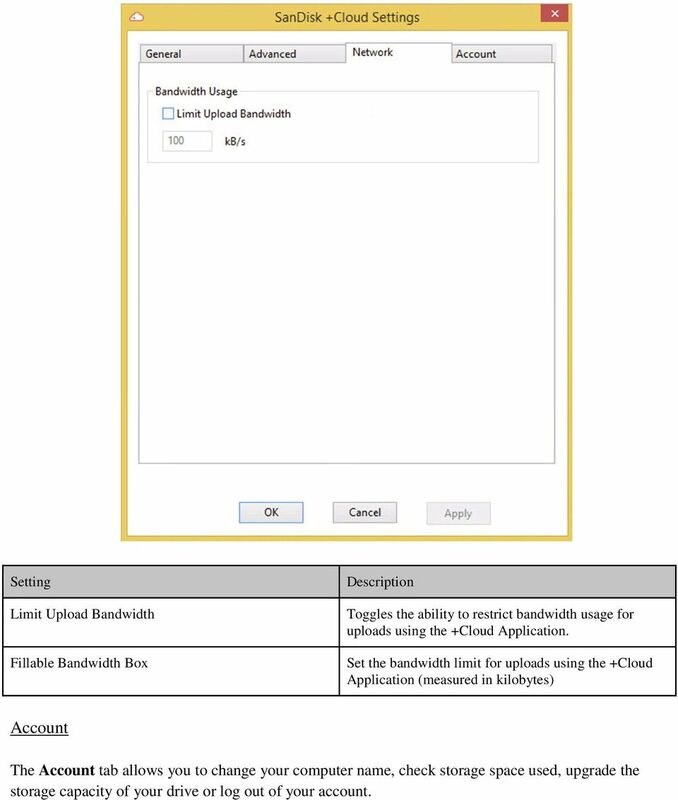 Set the bandwidth limit for uploads using the +Cloud Application (measured in kilobytes) Account The Account tab allows you to change your computer name, check storage space used, upgrade the storage capacity of your drive or log out of your account. 18 Setting Get More Space Rename Computer Log Out Terms of Service Description Opens an upgrade page in your web browser, to unlock even more functionality and storage for your +Cloud Drive. Change the name that +Cloud uses to identify your computer. Logs the user out of the +Cloud Application. Opens the Terms of Service page in your web browser. KeePass Getting Started on Windows This guide includes the initial installation of KeePass 2.x on a Windows PC, creating your first password database, testing the software and entering your first accounts. Table of Contents. 1. Overview... 3. 1.1 Materials Required. 3 1.2 System Requirements. 3 1.3 User Mode 3. 2. Installation Instructions..